→What is a Tweco® Style MIG Gun? The use of the phrase “Tweco Style” is not standard across the industry. But when you consider the context, you’ll find the usage falls into at least one of the following categories. Besides a leading MIG gun/torch manufacturer, Tweco is also a worldwide supplier of welding consumables. The most frequent use of “Tweco Style” is when welder manufacturers design MIG guns to use Tweco contact tips, nozzles, and diffusers. The manufacturers of better MIG welders want their buyers to have convenient access to quality consumables for their welders. Known to fit well, the Tweco line of consumables help keep electrical current and shielding gas flowing to the weld. For welders, this means less burn-back, good weld protection, and less downtime. You can also find copies of Tweco Style consumables of differing cost and quality. Not all brands or sellers are clear about consumable compatibility. Some sellers don’t seem to know (or care) what consumables work on their machines. Others want you to think their low-priced welding machines use high-quality and easy to find replacements. Later, you learn you must buy pricey consumables from the manufacturer to keep your inexpensive welder operating. 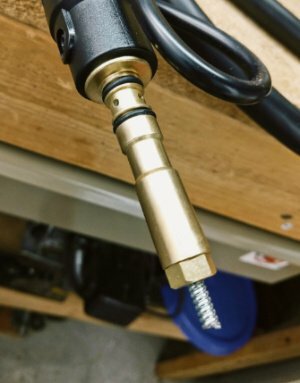 The low-end Tweco MIG gun for a 140-amp welder is too costly to ever find on a $150 welder. With nothing to hide, a good seller is open about the consumables you’ll need with your new welder. It’s clear that the MIG gun on this welder is not a Tweco, but uses Tweco consumables. My experience with Metal Man has been positive. I own their small welding cart, which I found easy to assemble and sturdy—and a perfect fit for Lincoln and Hobart 140-amp welders. 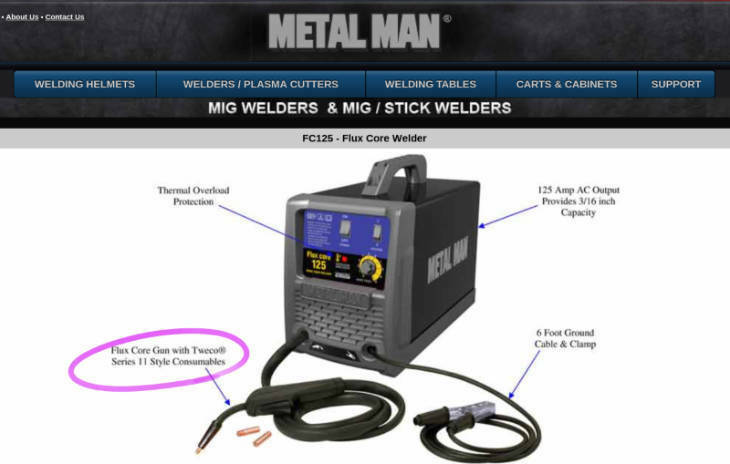 And we selected their FC125 flux-cored welder as one of the best welders under $200. Tweco style can refer to MIG guns made by Tweco for welder manufacturers without the Tweco branding. 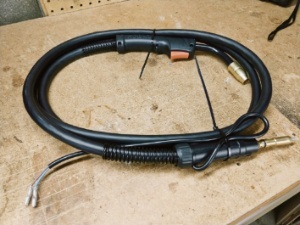 Some may refer to the quick connect plug mating the torch cable to the welder as a Tweco style connector. But more likely, they mean a connector fitting specific Tweco/Thermadyne welders. Also known as a back-end, or rear connector, they’re made in variations to fit Lincoln, Miller, Hobart and the Euro-style plug welders. Any modern MIG torch/cable assembly. 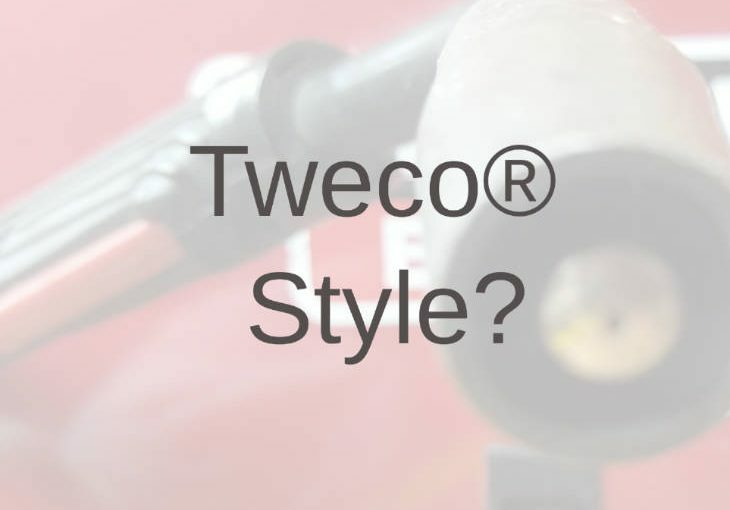 Over the last 50 years, Tweco’s self-contained, quick connect, torch/cable assembly has been copied, cloned to the point that some describe all similar torch designs as a Tweco style. Again, some manufacturers and sellers may use the phrase Tweco style only to describe a gun’s appearance. They hope buyers will believe the torch is of higher quality. What made Tweco’s design special? Previous welding guns used separate lines and connections for electrode, gas, current, and trigger control supplies. These MIG guns were unwieldy to use and involved a tedious process in changing torches. Describing existing welders in their patent, Tweco saw the need to improve efficiency by making it easier for welders to switch guns. We can thank Tweco for leading the way for the development of the compact, lightweight MIG welders we enjoy today. Tweco is a brand under ESAB, a leading manufacturer of welding and cutting equipment and consumables, including the Rebel line of MIG welders. Colfax Corporation owns ESAB. 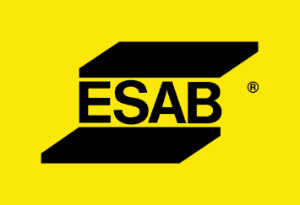 According to ESAB, Tweco products include air- and water-cooled MIG guns, manual and automated guns, MIG consumables, electrode holders, ground clamps, cables, and accessories. It’s safe to say that the Tweco design has been proven and adopted by other MIG gun manufacturers. 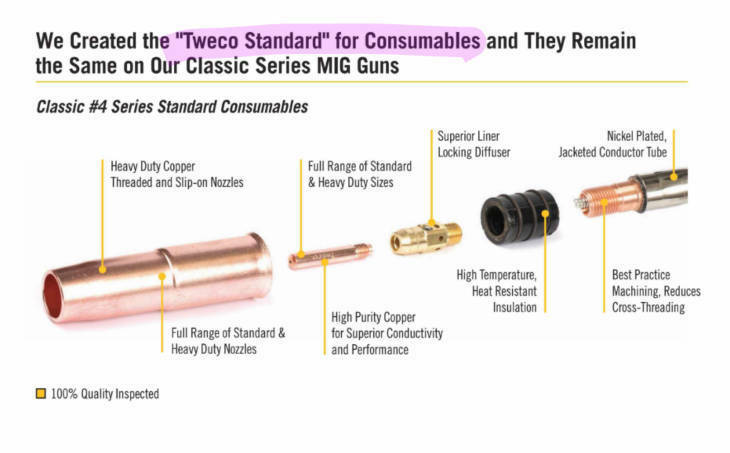 Over the years, running all MIG supplies through one cable became the industry standard, and you see evidence of the Tweco style in most MIG gun designs. With many similar designs and vague marketing language, buyers must take care to know what they’re getting when seeing the phrase Tweco style.